Think of a chair. An everyday object made invisible by continuous use. A light piece of domestic furniture in which comfort has the equal aesthetics. And what is a chair good for if not to sit down to eat, talk, wait, rest and live life? We have traced the identity of our ideal chair to create the profile of a happy, joyful object which leads automatically to evenings in the company of friends, with the family at home or in the garden, to moments in which chairs are moved to make room for a new arrival, to stack them easily at the end of the day or leave them outside overnight in the rain. 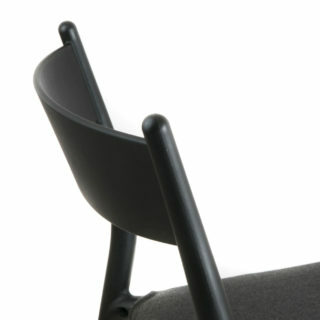 An object without boundaries other than the need to be practical, comfortable and user-friendly. 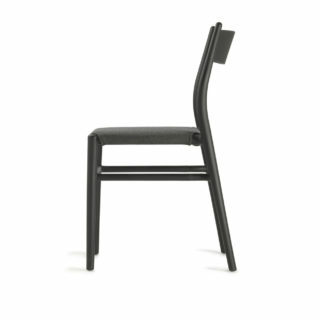 The Joi collection is a tribute to one of the greatest masters of the 20th century: Hans J. Wegner. A thought which flows along the same guidelines of beauty, simplicity and ergonomics. A decisive line traced by the imprint of great, proudly modern Nordic design, because real design follows life as opposed to fashion.Joi combines all of this with advanced construction techniques which allow accessible and flexible production in a variety of versions. Its main feature is the joint which allows the creation of three different chairs, inserting backs characterised by different personalities, uses and vocations.